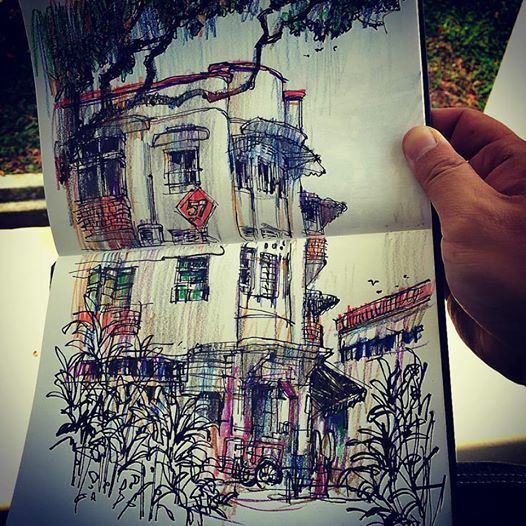 There is one location in Singapore I have been back again and again to draw and paint. Till date I have done more than 50 pen & ink sketches and watercolour studies based on the same location. At least about 40 pieces were sold in 2 group shows with "White Canvas" which is now a private gallery renamed as "Black Gallery" - managed by Colin and Maria who are the owners too. The group shows were held in 2010 and 2011, and those were the years when USK Singapore Chapter grew exponentially. 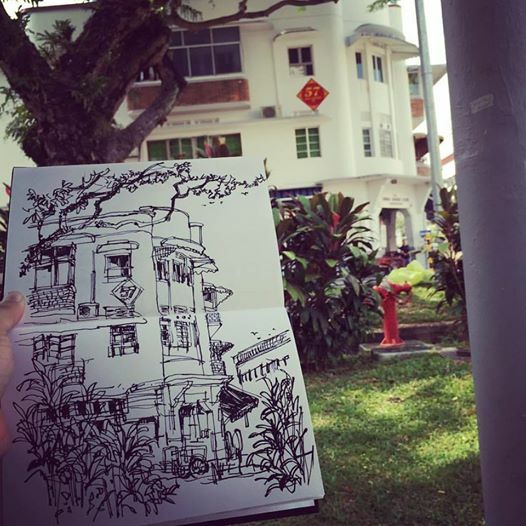 Tiong Bahru has been a favourite location for me to sketch and paint. The reason is very simple. The buildings are unique and the place is quiet. The morning breakfast crowd dissipates by 10am. The lunch crowd would arrive by 12pm but they usually congregate within the food center. In recent years, there have been many cafes and pubs opening in Tiong Bahru, but these have simmered down in the last 2 years, so Tiong Bahru has more or less become what was before when I first came to know the place. 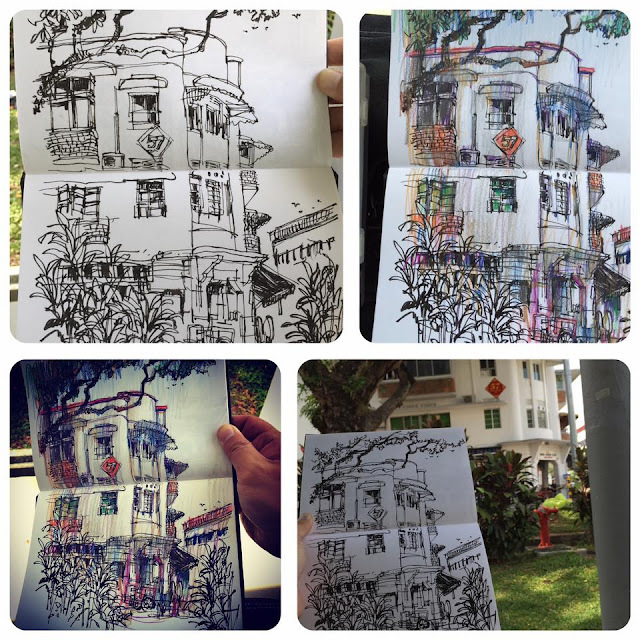 So far I have mostly used pen & ink, and watercolour for Tiong Bahru. I have not done acrylics or oil yet. It would be a challenge and I am still looking forward to a plein air session at this location. Anyway drawing and painting the same subject or location can be quite refreshing every time. You may visit the location at different time of day like what Monet did. I can vouch that it would be different all the time. If not you could try a different point of view, which I did all the time. Similarly you may use a different method to draw and paint, or create a series with different colour temperature or colour scheme. I like to change how I frame or format my sketches. This time I used the foreground foliage as a vignette for composition, though I wasn't really thinking of visual path and movement within the image, but I did think about using the darks for creating rhythm. And instead of watercolour, I change my painting medium to coloured pencils.